It was 8 a.m. and the company first sergeant was not sitting at the company office. Combat camera Marines weren’t at their usual desks in the basement of Building 1 here, taking work orders for U.S. Marine Corps Forces, Pacific. Pacific Command was missing a Marine noncommissioned officer. They weren’t the only Marines away from their usual work spaces. There were 21 Marines and one Sailor going blow for blow in the Marine Corps Martial Arts Program room here Nov. 16 as a part of a MCMAP class, Nov. 14-23. The Marines who chose to participate in the course arrive every weekday morning to be told what their training will entail, anything from conditioning exercises to sparring. During the course, they are tested physically and mentally. Sgt. Antonio I. Santiago, a reserve integration NCO, operations section, MarForPac, teaches his students alongside two other instructors, Sgt. Corey Etibek, a training NCO at PACOM, and Petty Officer 2nd Class Chris M. Dare, administrative leading petty officer for the force surgeon at MarForPac. “[The purpose of the program is] to get the Marines into a combat mindset and to develop physical, mental and character discipline,” said Santiago. Santiago has been an instructor since March 2011 and has enjoyed teaching the martial arts program to Marines of such a variety of ranks. He said the diversified ranks in the room are something you don’t see all the time. The students, at different stages in their Marine Corps careers, vary from young lance corporals to lieutenant colonels. They all have one thing in common; they are excited to train and move up a belt. When Marines arrive at the training room, their ranks, size and gender are left outside. 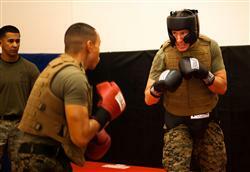 Levels of intensity and aggression are all that count when the Marines are on the mats in flak jackets and boxing gloves exchanging punches. These warriors come to the training area for different reasons. 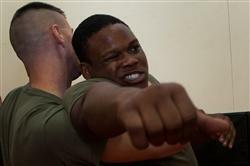 Some have a strong fighting spirit and use the program as the chance to get into a tangling fist dance with fellow Marines. 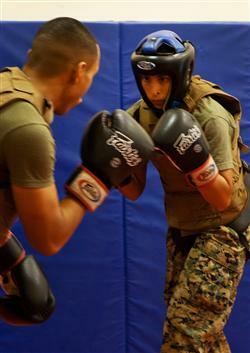 Other Marines take the scheduled class to get their recommended training done. Because Marines need the training, Santiago is trying to schedule another course for December and plans to continue running MCMAP courses every month. “I think every Marine should be pushed past a tan belt … every Marine should know how to fight,” Cox said. Santiago recommends the program for any Marine who needs to move up in their MCMAP belt or just wants to learn fighting techniques. This training is similar to mix martial arts. When it comes to worst, there is the inevitable hand to hand combat. There are also knife training courses. Martial art is one of the best self defense technique that every one should learn. This will give you the confidence to defend yourself in case of severe situations like holdup and other unfortunate events. The VAT has changed the system of business in UAE and most of the business trust over Auditors in Dubai to manage their updates yearly, monthly or even quarterly to achieve the target. Well, this year is so crucial and auditors in town are rushing to update the accounts even so fast and better manner. The leading Top 10 Auditors in UAE representing the honorable function of best auditing firm of this year in a surprising event. The academy awards nomination polls and predictions finally did. 24 different category awards and the 2019 Oscar Academy awards nominations has been announced successfully and awaiting the red carpet for the choosing the winners in the official function. All the students can check their UP Board 12th Result 2019 here on this page. Students who are currently searching for UP Board Result 2019 Class 12, you are on the correct website at upresults.nic.in. thank you for seeing to my posts.